Previous articles of this series concerned voting methods and how a balanced voting method would likely lead to more political parties. Breaking from that pattern, this article will consider consider the related question of whether an accurate count of the votes is possible. While both matters are important, managing one of these problems need not wait on a solution for the the other. Sometimes I do sense that people do feel that way -- that so long as we cannot trust the vote-count, what would be the point of changing the voting system? As a practical matter, progress on either one of these problems will take considerable effort; both issues need to be resolved, however, and progress on either issue has to be welcomed. One security hazard for elections held using plurality voting (our current voting system) is that plurality voting is so very familiar to us; it is the system we have used at least since the founding of the country. Someone inclined to game that system has had abundant time to learn ways to do it. But that is also a vulnerability of those who play this game. Simply making any significant change to the way we vote would negate some of that experience and force a re-thinking of techniques, something that might take some years. The change might only give temporary relief from vote manipulation, but even that would be a help, perhaps opening an opportunity for democracy to creep through and enact other reforms such as to the way we count votes. -counting problem. To be fair, computers do seem to have made the problem much worse and more people are aware of the issue. People who look at this problem often advocate a return to hand-counting of paper ballots and that seems a good idea; in fact most other countries that have experimented with voting machines have gone back to hand counting. But hand counting of paper ballots is not a panacea; even before there were voting machines there were serious problems with the counting of votes. With paper ballots there were problems with ballot-box stuffing and of course with manipulation of the voting rolls. But another weak spot in the system was with transporting the ballots and with ensuring that the vote-count was properly reported and tallied as local counts were consolidated into a statewide count. Paper ballots were altered, removed or more ballots added as they sat in warehouses or even as police transported them to those warehouses. And sometimes vote-counts got altered as they were passed along from substation to central tally locations. At the very least, those techniques were often suspected of corrupting the vote count. Vote counts were under suspicion long before there were computers. But the internet could help shed a light on the vote counting process and that could reduce cheating. By posting voting results - at multiple web sites - once they are counted locally and again as more composite results are computed, millions of eyes could look and check that the numbers are consistent; and probably at least thousands of eyes would take advantage of that opportunity. The idea is to make it possible for anyone with a computer to access each step of the count. With so many people able to check the tallies all along the way it would become very difficult to hide any alterations. Sunlight may truly be the best disinfectant, able to correct accidents as well as intentional cheating. But of course the parts of the voting process that now seem most vulnerable to cheating are the voting machines. The software in these various machines can be easily altered so as to engineer a desired outcome. To make matters worse, the software is considered propriatary and cannot be examined by anyone outside the company that owns that software. And in use, the machines are managed by private companies who are in a position to easily make alterations to the software, even at the last minute before polls open. Were that not bad enough, with a voting machines there can be no effective re-count. Under these conditions it is hard to imagine there is not rampant cheating. It is little wonder that other countries have largely abandoned use of these machines. 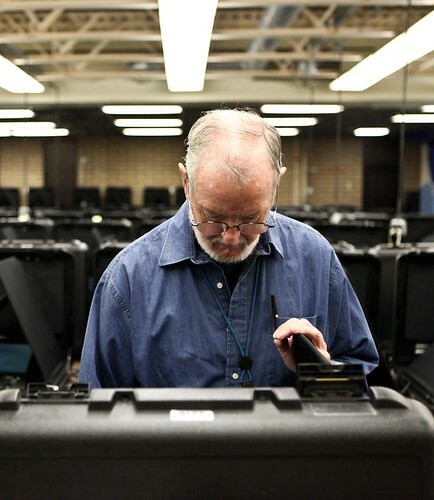 What is surprising is that the United States still does allow voting machines to be used. But if we can't bring ourselves to stop using them, could these machines be made less vulnerable? You might notice that the major problem with these machines lies in their versitility. And for a moment consider how much versitility is actually needed in a voting machine; they don't really need much. The fact that these machines run software that can easily be altered is at the root of why we cannot trust them. The fact that the software is propriatary is another problem, but there is no reason that has to be; it is certainly feasible to hire programmers to write and test software that is released into the public domain so that anyone can examine it. But let's get back to the versitility issue. Can we avoid the apparent need to permit technicians to secretely alter the software in the field? Can computers perhaps be built that run only the software that was installed at the factory? Without any doubt - the answer is yes! Such machines not only can be built but there are machines that are built that way, though the practice is becoming less common today. These are called "embedded systems" and an embedded system can easily be designed and built in such a way that field modifications of the software would be, for all practical purposes, impossible. This is not at all cutting edge technology; rather it is old technology and you probably have examples of it in your home. Washers, dryers, CD and DVD players, calculators and even automobiles have for several decades had computer systems in them but until very recently very few provided any way to update the firmware; they had a simple job to do and they were programmed to do that job at the factory. Even many years ago, permitting field updates of firmware was a technical possibility but until very recently, that possibilitywas rarely regarded as worth the added costs. Voting machines could be built using this older and much more secure technology; they could be built so that changing the firmware, even in a factory environment, would be more costly than just replacing the entire device. And of course if these machines were built through government contract, the firmware would be government property and it could be made readily available for public inspection. This would give us a check that there are no hidden trap-doors designed to defeat the appropriate use of the machine The problem is not really that more secure voting systems are impossible; we just are not taking advantage of that possibility. A secure voting machine of this description can be built to handle any variety of voting methods, however those methods have to be anticipated and programmed into the voting machine at the factory. On balance, this seems a very small price to pay for a more secure vote count.